White Plains has built an enviable filmography over the last couple of years with the help of Westchester County Tourism & Film, and County Executive Rob Astorino’s support of film activity in the county. In 2017 alone, industry heavyweights like Martin Scorsese, Steven Spielberg, and Steven Soderbergh filmed projects there. And, Emmy Award-winning shows like “Orange Is The New Black” and “The Americans” are White Plains regulars, using its streets, homes, and businesses for locations season after season. The team behind White Plains’ film renaissance is Mayor Tom Roach and the City’s Special Projects Manager Jill Iannetta. Over the last few years, Roach and Iannetta have established White Plains’ reputation as a film-friendly municipality and local government, hotels, restaurants, and private homeowners have reaped the benefits. Here they share how they’ve turned White Plains into the “Hollywood” of Westchester County. Q: Why is White Plains so appealing to the film industry? Q: How did you maximize the impact of filming? A: TR—We put the film function under the auspices of Jill Iannetta, and she serves as the one point of contact. We’ve worked collegially with Westchester County Film and the New York State Film Office. We maintain a virtual portfolio of private homes, businesses, and locations so it’s easy for location managers to access. We provide crews with menus for local restaurants and hotel info, and help guide them to local businesses. A: Jill Iannetta—The crews usually use craft services during the day, but they’ll often spin off for private meetings or meals, or they’ll require hotel rooms. The second meal of the day is usually one they’ll get from a local restaurant or chain. A: TR—The film community is small. They know each other and they talk to each other. So if they know that “yes” means “yes,” they are more likely to spread the word and come back again. Q: How do residents and businesses feel about filming? A: TR—The vast majority of people love it. They only get frustrated when they see film activity and we won’t divulge what it is. Our policy is to maintain confidentiality until the production is finished. A: JI—The more we communicate with local residents, the smoother everything goes. We require that productions paper the neighborhoods with notices to minimize disruption. We’re also only a phone call away and are ready to step in if issues arise. Q: How has filming benefitted White Plains financially? A: JI—Our film permits are up 100% this year over last year, and for next year, we’ll see the same increase. Beyond the permits, we have hotels, restaurants, mom and pop businesses, and private homeowners who are also profiting. A: TR—We also have non-profits, like churches and meeting spaces that benefit financially. We also generate revenue from permits, from parking at city properties, and for public services, like police. Q: What are your most popular locations? A: TR—Church Street plays well as Washington, DC. The Galleria has also seen a lot of filming. Stepinac High School was a location for a new show, “Rise,” that will air on NBC in January. A: JI—For us it’s really about portfolio diversification. We’ve built personal relationships with location managers and when they’ve had good experiences, they come back again. We have so many different types of locations, and we bring that diversity to them depending on what they need. Q: What’s the craziest request you’ve either said, “Yes” or “No” to? A: TR—For Martin Scorsese’s new film, “The Irishman,” we let them do a scene with a huge car explosion. It was very carefully handled and we insisted that it happen at a decent hour. We recently had a request to land a helicopter in a residential neighborhood. That one was a “No.” We’re willing to work with productions, but we also need to balance that with the peace and safety of our residents. 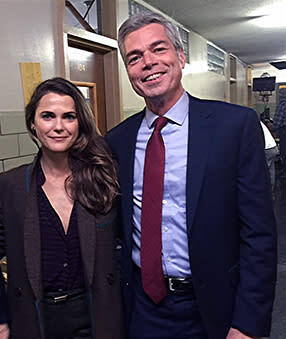 Photo caption: White Plains Mayor Tom Roach with Keri Russell, star of “The Americans” (FX).